These real baby names were taken from birth announcements listed on the website of a small California hospital from earlier this year! 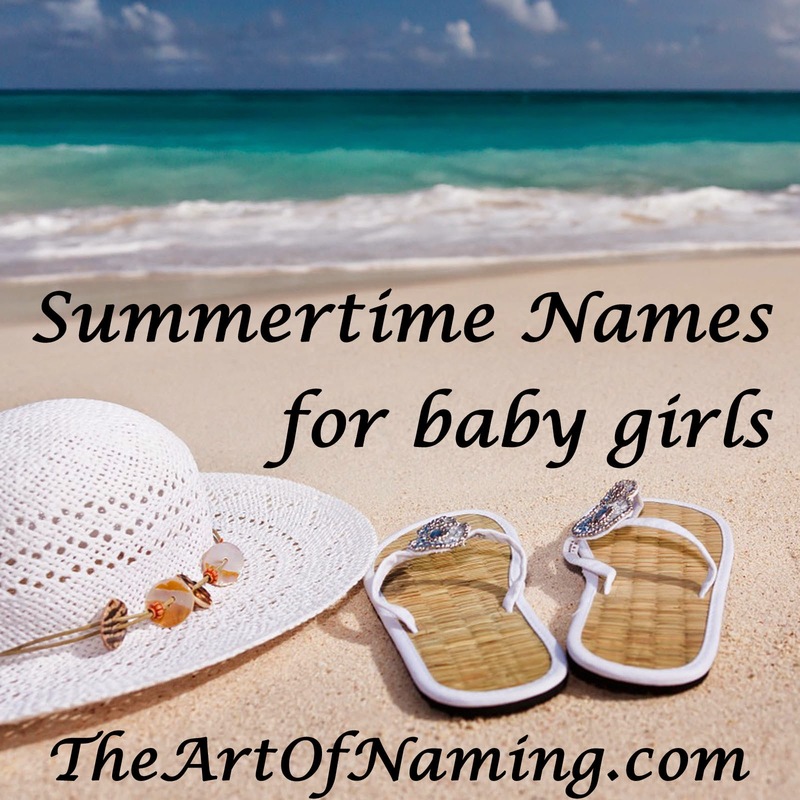 I found this compilation to be quite diverse; from the more proper names like Abigail Virginia and Ronald Richard to the more fun and creative names like Tymberlyn and Bodee. What do you think of this list? Which is your favorite? 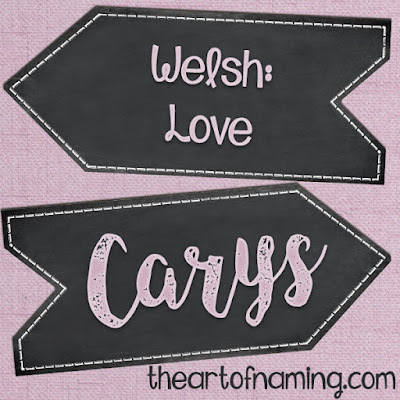 The last piece in this week's World-Wide Wednesday segment on Welsh names is the lovely girl name Carys. Pronounced ka-RISS or KAH-ris in Wales and sometimes CARE-iss in the US, it comes from the Welsh word caru which means "love". In the stream of time as far as names go, Carys is actually somewhat modern. It has only been in use since the middle of the 20th century in Wales. The most recent stats I can find rank the name at #239 in England/Wales. Carys has only been used in the US since 1991. It never received more than 16 births in a year until it suddenly got a boost in 2003 with 106 births. The cause of this increase is most likely because of Welsh-born actress Catherine Zeta-Jones and her husband Michael Douglas choosing the name for their daughter in 2003. Since 2003, the name has consistently continued to receive at least a hundred births per year but it hasn't had more than 200. In 2013, there were 122 girls given the name for a ranking of #1695. This name could also be spelled Cerys but that spelling is even less used, only on record since 1998 and never receiving more than 13 births in one year. It has probably not gained more popularity in the US since it is a Welsh name with a not-so-common pronunciation. It will probably remain under the radar and dance in the #1000-#1500 range unless something else happens to boost it again. That means its a great, unusual choice if you're looking for something different. Revision: Carys ranked at #2788 in the US for a total of 61 births for 2016. Which means my prediction above was off. The name actually declined even more from 2013 to 2016. This still makes it a great option for parents who want a rare name. Welsh baby names are very interesting. Traditional names have their own rules that may make the names complicated to pronounce for those who are not familiar with them. Let's start with a bit of information about surnames in Wales. From the 15th century onward, families adopted a fixed family name. Before that, they used a patronymic naming system in which a "surname" was derived from the child's father's name. This kind of naming was especially telling for the male line throughout the generations. 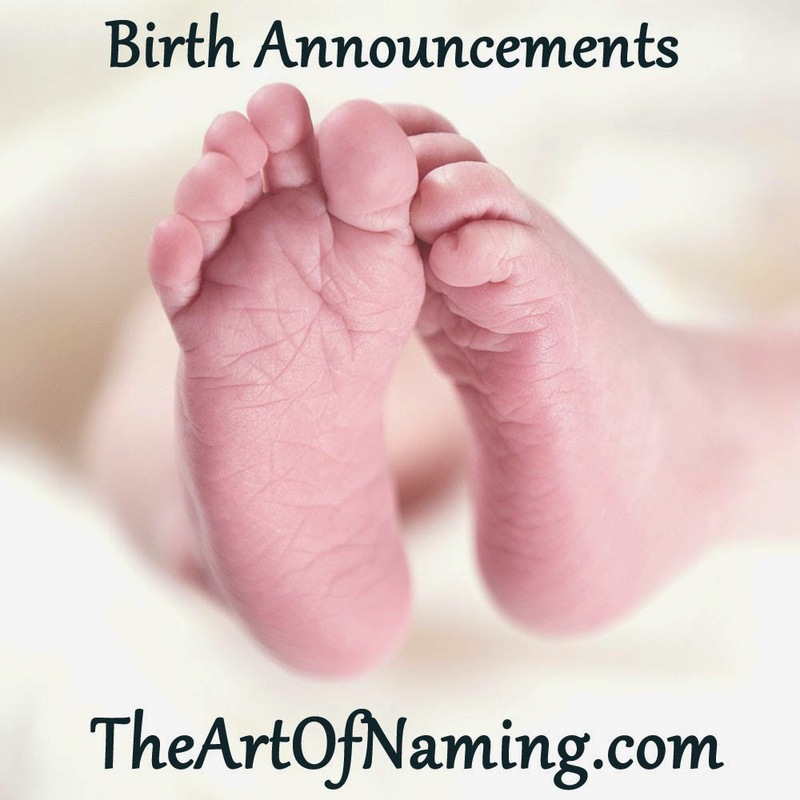 Typically, a person's baptismal name would be linked to their father's baptismal name by the letters ap or ab (son of) for a boy, and ferch (daughter of) for a girl. As an example, Evan son of Thomas would be known as Evan ap Thomas. 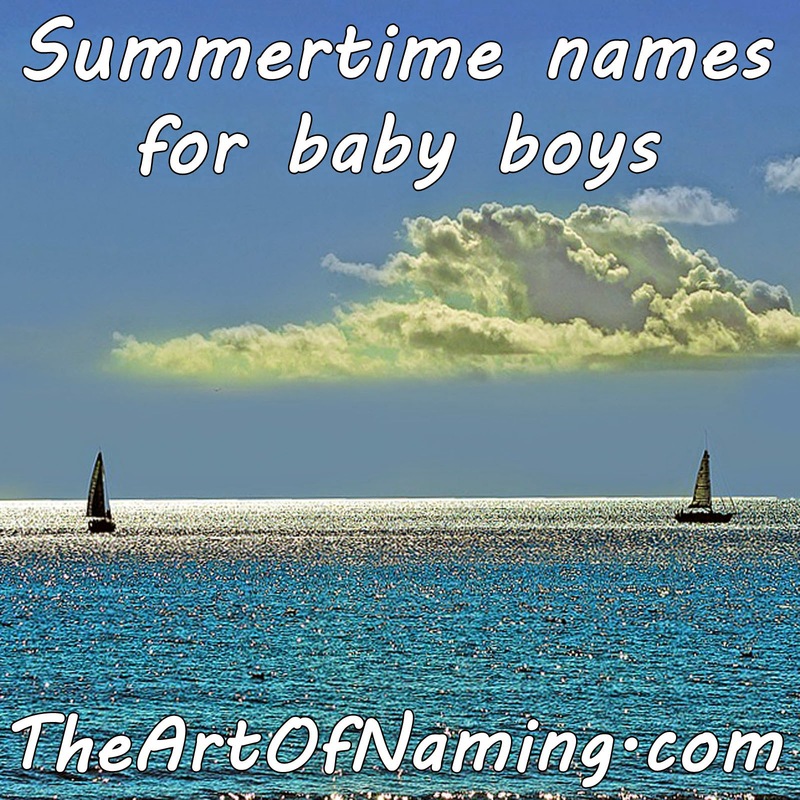 This naming method gave rise to boys whose surnames could be extremely long to incorporate the names of their fathers and grandfathers for several generations. For example, it was common to have a name that looked like this: Llewelyn ap Dafydd ab Ieuan ap Griffith ap Meredith. This was in place by Welsh law so that it was obvious to see how people descended from which ancestors. Later, these laws were abolished in the Middle Ages and replaced by a fixed family surname system that was easier to keep track of. However, there was still an element of patronymic names being used in varous forms until the early 19th century and especially in rural areas. Areas with strong English influence and wealth were the first the drop the patronymics system. As this surname transition occurred, the new fixed surnames were morphed from the old system. For example, the surname Powell came from ap Hywel and Bowen came from ab Owen. Price comes from ap Rhys and Pritchard comes from ap Richard. The ap and ab were eventually dropped altogether in favor of simply adding an S to the end of a name like Jones, Roberts or Edwards. This was influenced by the English. It is also common that people with the same surname in an area are completely unrelated, having simply chosen the same surname. Jones, Williams and Thomas are among the most prevalent surnames. A survey estimated that about 9/10ths of the Welsh population have a total of just one hundred surnames. Source. What do you think of these Welsh names? Have you ever known someone with a name like this? Source. Of course, in modern day Wales, the most popular baby names tend to match up more with English tastes than with old tradition. In fact, most of the time, England/Wales are categorized together just like that. This means that most of the names being given to Welsh babies are English favorites like Harry and Amelia. 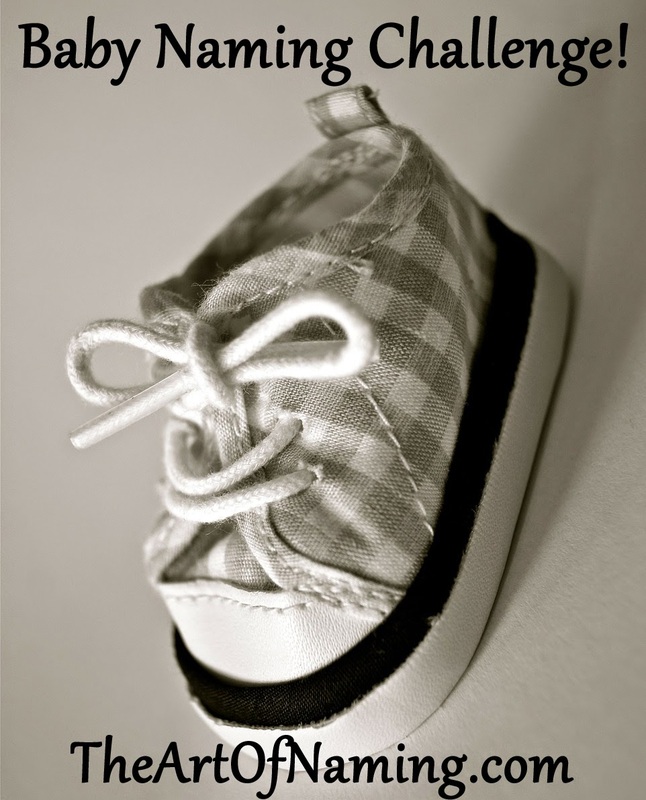 Let me know what your thoughts are about Welsh baby names! If you're from Wales, feel free to offer some insight or more information regarding names. Note: I am not Welsh nor have I ever been to Wales, so if any of the above information is incorrect or lacking, please let me know! Thanks for reading! 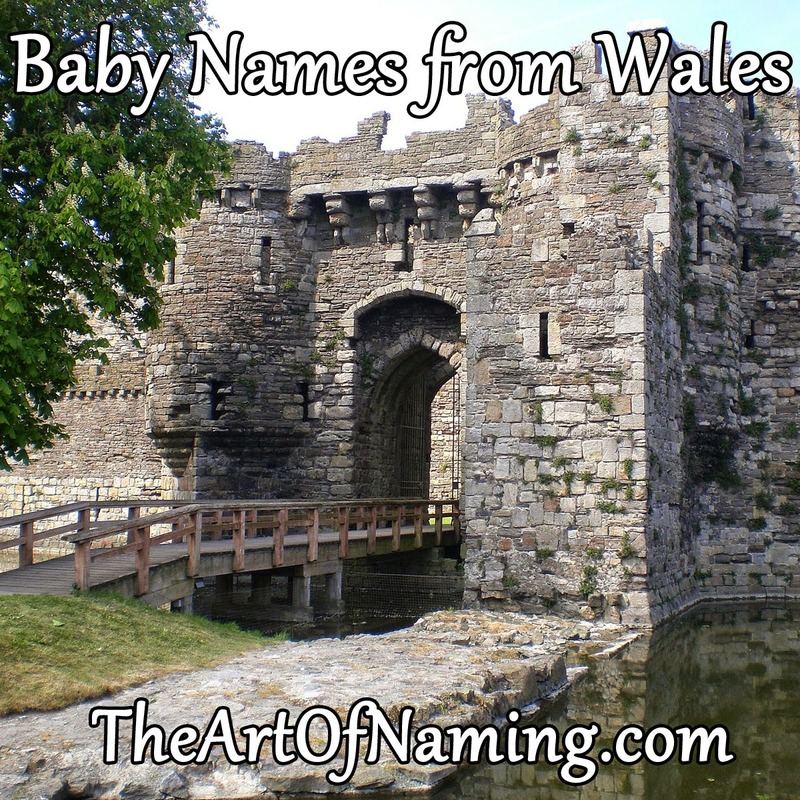 In this month's World-Wide Wednesday, we'll be visiting Wales and examining their baby naming traditions! To kick things off, let's take a look at a Welsh boy name: Rhys. 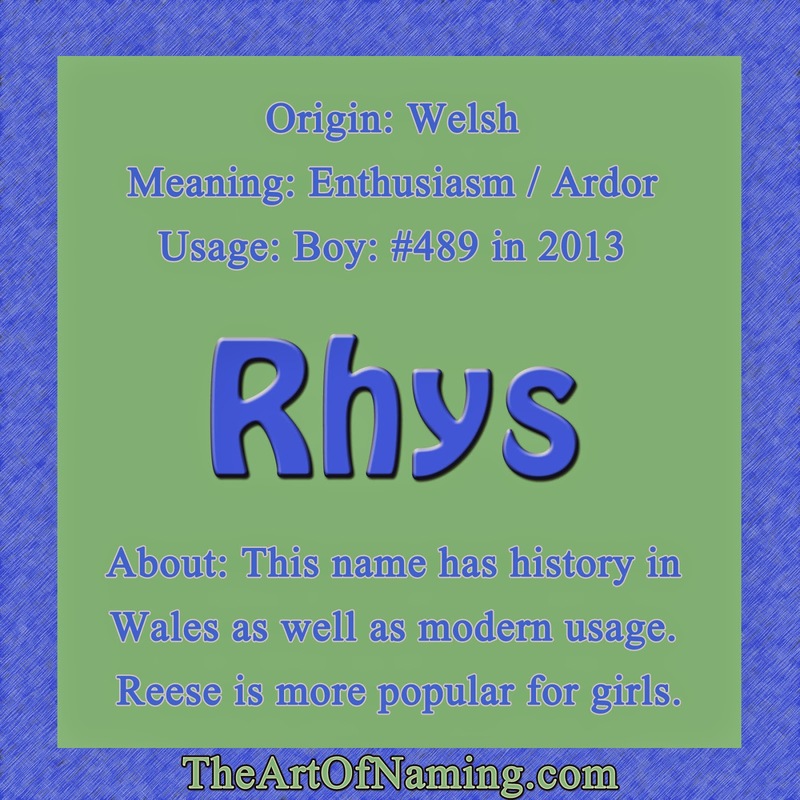 Rhys is pronounced like Reese and is the name that Reese and Reece spring from. 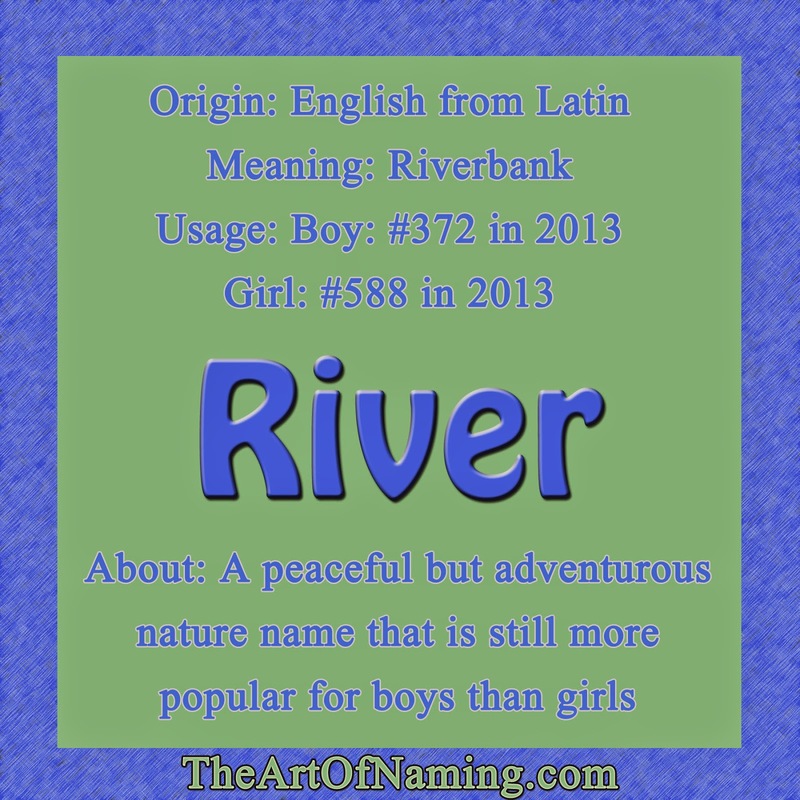 Many girls are given these variations but it is originally a masculine name. In fact, there have been several Welsh rulers named Rhys. In Welsh, the name is said to mean "enthusiasm" or "ardor" which is a great, positive meaning to have in a name! In Wales, the name has quite a bit of history as well as modern usage. It ranks in the Top 100 in England/Wales, Ireland, Northern Ireland and Scotland making it a popular choice for boys! However, in the US, Rhys isn't quite as popular. It has definitely been gaining some attention though. Rhys was first used in 1929, then 1941. It wasn't until 1946 that it gained some more regular usage. Very slowly it began to gain favor with parents. In 2004, Rhys made its debut appearance on the US Top 1000 chart at #940. Now it has inched its way upward to #489 in 2013 which accounts for 555 male births. There were also 26 female births for a ranking of #5245. This new popularity that Rhys has been experiencing could have been partially influenced by three actors, one named Jonathan Rhys Meyers, another named John Rhys-Davies, as well as a Welsh-born actor named Rhys Ifans. The name has also been used on a celebrity baby in 2009: Rhys Edward, son of Joey McIntyre of New Kids on the Block. I think Rhys is a name that will continue to gain popularity with this spelling for boys. The Reese spelling is massively more popular for girls, ranking at #156 and only ranking at #602 for boys. I think the genders can share this same sound but use their own spellings. That would make it kind of unisex and kind of not and I think that's cool! What might you pair with Rhys? I came up with a short list of unisex names to potentially feature and it was hard for me to decide between them, so I took the question to the wonderful people on Instagram! The first poll narrowed the list to three names, but the voting was very close on the final three. It came down to Finley, Lennon or Phoenix. In the end, I tallied all of the votes from both polls together and Lennon was the winner! Upon hearing the name Lennon, the first thought that may come to many peoples' minds is that of the late John Lennon of super rock group The Beatles. 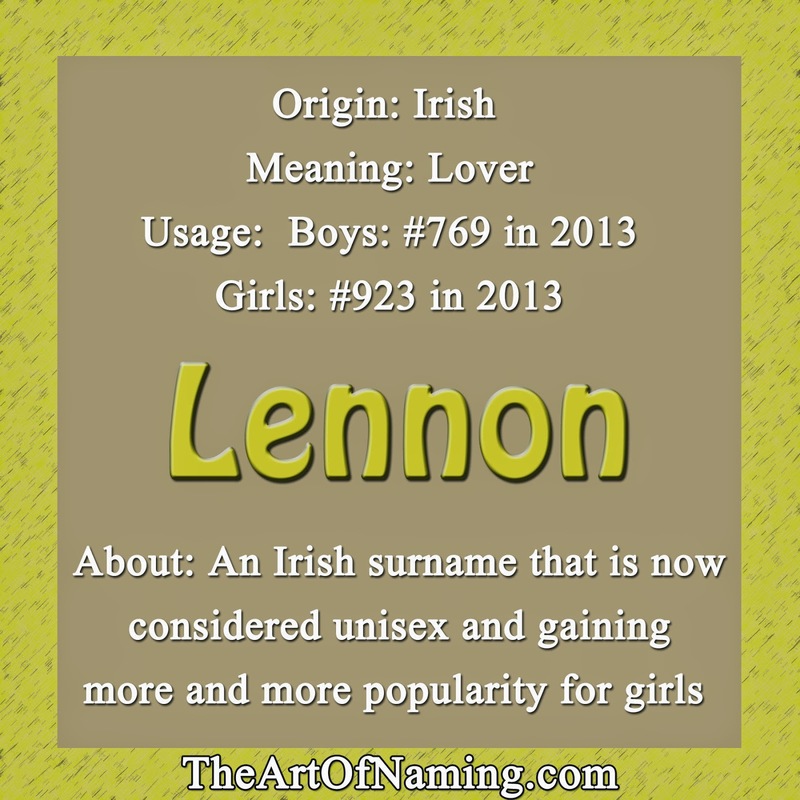 Beyond the musical connection, which is probably a huge reason parents choose the name, Lennon actually comes from an Irish surname. It has been anglicized from Ó Leannáin which is basically a patronymic name meaning "descendant of Leannán". Leannán itself is said to mean "lover" in Gaelic. Lennon is now considered a unisex name. Originally, it was only given to boys from 1913 to 1980 in the US. Girls were slowly given the name starting in 1981 and it has quickly caught up to the same ranks as the boys. In 2013, there were 273 girls named Lennon and 289 boys which makes this name nearly even for both genders because of its 51/49 split. It has only gained this boost of popularity for girls in the past year. The birth split for 2012 was 33% girl and 67% boy. Before that, the difference was even greater. If you're wondering, as of 2013, the boy Lennon ranks at #769 and the girl Lennon ranks at #923, joining the Top 1000 for the first time ever. It will be interesting to see if this iconic surname of a male rock star will eventually be turned into a name that's favored by females. As a baby name choice, like I mentioned, Lennon is a musical honor name. It joins the ranks of others such as Hendrix, Jagger, Marley and Presley. As far as nicknames go, the most obvious would be Len or Lenny. However, nicknames aren't very necessary when the name's only 2 syllables long. 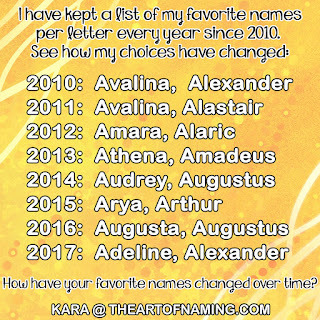 Share your name pairing ideas in the comment section below or on Facebook! I went through the US Top 1000 baby names for 2013 and pulled out as many unisex names as I could. At least one name had to be in the Top 1000, but most of the names are on the list for both a boy and a girl. If you can think of any names that I missed --and I'm sure there are a few-- let me know so that I can include them. Seeing information like this is helpful for those who are considering a unisex name but are unsure of how popular it really is for each gender. For example, Harper has really skyrocketed up the charts for girls lately. If you have always pictured it on a boy, it may be handy to know that only 4% of all Harpers are boys. Perhaps that matters to you, perhaps it doesn't. Either way, that kind of information can be found here. 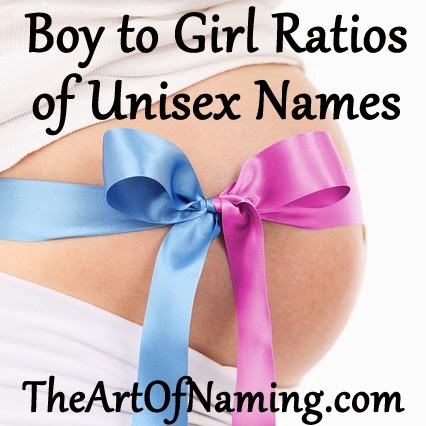 You may even come across a name or two that you had no idea was somewhat unisex. The last post in our Summer Names segment is this lovely girl name. Pearl is considered a rather old-fashioned name but it is coming back into style today! I chose this name because it is the birthstone for June, a summer month. Historically, pearls were a favorite gem during the Roman Empire. Tudor England was even nicknamed "the pearl age" during the 1500s. They were probably so popular because they are said to give wisdom and bring wealth, protection and luck. They symbolize purity, generosity, integrity and loyalty as well. That's quite a lot for a baby girl to live up to if she's named Pearl! Pearls are also unique in that they're the only gems that come from living sea creatures. This means that they have a natural beauty that is not made or altered by man or machine. However, cultured pearls dominate the market in place of natural pearls and have since the 1920s. 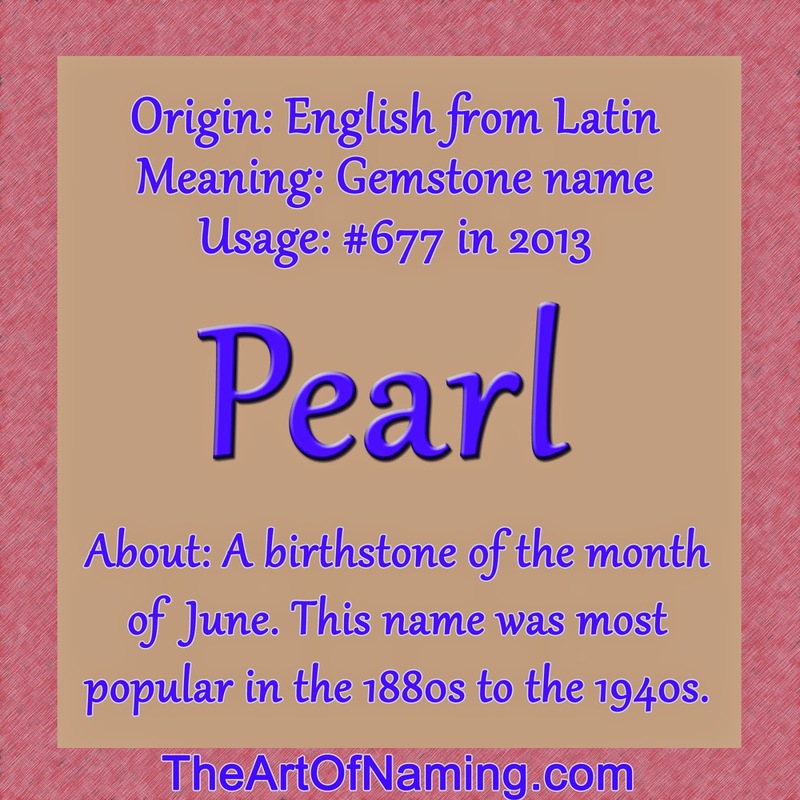 As a baby name, the English word pearl refers to the concretions formed in mollusk shells, like I mentioned, but it ultimately comes from the Late Latin word perla. It has been used as a name since the 19th century because of its lasting popularity as a gemstone. Today, many celebrities have already used Pearl for their daughters' firsts and middle names. At first thought, Pearl may seem like the name of someone's great-grandmother and you wouldn't be incorrect in that association. Pearl was very popular from 1880 to around 1940. Pearl peaked in popularity in 1918 with 4,521 births and a ranking of #56. Slowly, Pearl lost her fashionability. She dropped out of the Top 1000 in 1977-1978, from 1987-2006, and 2008. However, she's climbing back up the charts now and is ranking higher than she has in years! In 2013, 416 baby girls were named Pearl for a ranking of #677. She has a long way to go to hit the kind of numbers she saw in 1918 but it could happen again, especially since she fits the 100 year rule.